*** Update - 11/1/2017 - Our Hoopla policies have changed. So that we can bring you more content on more platforms, we have changed the number of checkouts per person to 4 titles a month (any combination of movies, TV, audiobooks, ebooks, or graphic novels). Regular readers of this blog will doubtless be aware that the Free Library has been testing the waters with streaming media these past few months. Well, today we're finally ready to jump in and announce our newest digital media service, Hoopla! Hoopla is a digital platform that offers streaming movies, TV, music, and audiobooks for your PC, Mac, tablet, or smartphone. Think of it like a Netflix for libraries. You'll find a wide selection of current, popular titles to enjoy for free when you login with your Free Library card and PIN. And because you stream, rather than download, content from Hoopla, there are no waiting lists, no holds, and of course, no late fees! You'll can access Hoopla over at the Streaming Video section of our Digital Media page. Every Free Library card holder can checkout 4 Hoopla items per month (any combination of movies, TV, music, etc.). The first time you visit Hoopla, click 'Sign Up' in the top right of the screen; agree to the terms of service, select 'Free Library of Philadelphia' as your library, and register with your library card number, PIN, and email address. If you or your child logs in to Hoopla using children’s Free Library card, you will only be able to checkout movies rated G or PG, TV shows rated TVY, TV7, TVG, TVPG, and TVY7FV, and music without an explicit lyrics warning. If you or your child has a 'Video Restricted' card (parents use these cards to restrict their children from borrowing DVDs in our libraries), you will not be able to login to Hoopla. To change this designation, parents should speak with a librarian at their neighborhood library location. Hoopla is compatible with Mac and PC. There are mobile apps available for both Apple and Android devices in the iTunes and Google Play stores. The first time you use Hoopla you may be instructed to install the Widevine plugin. Widevine is a plugin designed by Google. It allows Hoopla to play videos in your browser. Widevine is supported by most modern browsers. However, currently Internet Explorer 11 is not supported. If you use IE11, you can download the Google Chrome browser free and use that to watch Hoopla videos. Visitors using the public PCs in our Neighborhood Libraries to access Hoopla should use the Chrome browser. If you run into trouble, you can access Hoopla help 24/7. Of course, you can also always contact us with your questions and concerns as well. Please give Hoopla a try and let us know what you think of this new service in comments section below. Hoopla works on all your devices! Terrific news. I've already downloaded the app and borrowed an audiobook on my Nook HD. Love that I can download it for offline listening. Thank you adding yet another wonderful service! I'm unable to use this on my PC, which uses Chrome. "Not all platforms are supported on all products and the platform currently used by your provider does not support ChromeOS. Please consider this my request that the Free Library of Philadelphia enable support for this platform. Hello Carolyn - I see that you've also submitted a question to our contact us and I will respond to you there. For other users benefit though, I have checked with Hoopla and at this time they do not support ChromeOS though they in development with a solution (to clarify though, this only applies to the Chrome Operating System, people with the Chrome browser installed on a machine running the Windows, Mac, or Linux operating systems should not have a problem). Just to clarify on the last point...PC with the Windows Operating system that use the Chrome browser are supported (however, you will still need to install the Widevine plugin mentioned above). However, Chromebooks (dedicated laptops that run on the Chrome OS) are not supported at this time. Will Android mobile be supported in the future? What great news! I love my library! Hoopla is a fantastic addition to the library's resources and hopefully it will remain permanently. The music section is extremely extensive. This is awesome!!! So far it works perfectly on the Mac. Hi Eva - Hoopla should definitely work on an iPhone. Why not send us an email at the Contact Us link at the top of this page. Include your library card number, the model iPhone you're using and the version of iOS you have. We should be able to help you get this going! I would really like to stream video and music to my television. However, I can only do this on my ROKU. Please let me know if this will be possible. Thank you. Hello Ms Davis - currently you can only stream movies and films from our collection on IndieFlix to your Roku. Hoopla does not yet have a Roku channel. According to their FAQ page, they are working on developing a channel, but we don't have a launch date yet. Keep an eye on our blog for updates. If you would like starting watching films from IndieFlix on your Roku, start by visiting our Digital Media page (http://search.freelibrary.org/digitalmedia.cfm) and setting up an IndieFlix account. Then, add the IndieFlix Roku channel to your device get started. The true digital age has arrived and I am absolutely astounded! Love, Love, Love, Hoopla. Thank you so very, very much for introducing this to library patrons! Definitely a KEEPER!! I installed hoopla on my iPhone and borrowed an audio (library) book. (The librarian helped with this since she knew what she was doing more than I did.) But only one chapter played and that is the end of anything from Hoopla! I am missing the next 8 hours on my book and nothing will make hoopla play even the first chapter, let alone the next 8 hours. My iPhone is fairly new and has much available space. What could the problem be? Hello Roxanne - sorry to hear you're having trouble. The amount of space on your iPhone should not be an issue since Hoopla is a streaming service and nothing is downloaded to your phone. With Hoopla your audiobook comes directly from the web (this is why you need a web connection to use it). It is a difficult to help you over the blog though. If you're still having trouble, please send an email to us using the 'Contact Us' link at the top of the page. Include the name of the audiobook you're having trouble with and your library card number. Thank you. I had no problem loading to my iphone, but it's showing that its downloading the movie I chose? The above states that it will stream, but not in my case. How should I proceed? 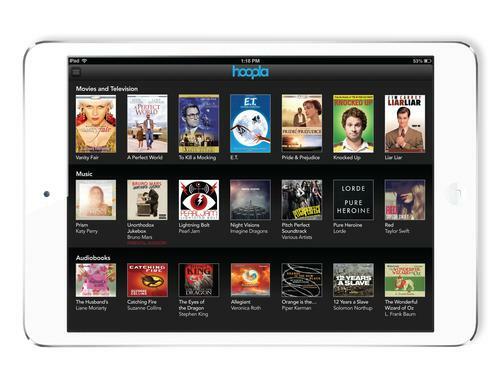 Can you watch one of the movies from Hoopla while on an airplane? Can you read or listen to a book on a plane? Hello Diane - Whether or not you can use Hoopla without an Internet connection depends on your device. According to Hoopla's Help pages: "to browse hoopla content and to stream content over Wi-Fi, 3G and/or 4G you must be connected to the internet. However, on our mobile app you can complete a temporary download to play content without an internet connection." So, if you are using the mobile app to checkout and temporarily download a title before your flight, you should be good. You can also get help from Hoopla directly at info@hoopladigital.com. Thanks! great article.thanks for share .it is very useful for me.i can learn some useful knowledge here. Hi! I don't see Hoopla on your Digital Media page. Are you still offering the service? Thanks! I like to stream movies and music and plus it's free ! Run into a problem with my LG smart screen conntected by video cable to my iphone 5. Was doing a great job giving me Hoopla movies on big screen. Was away too much in Sept. to use it and now the 'Welcome to Hoopla' message shows but stops as soon as I go to play on my phone screen. Both the phone and the tv screen go black. The movie shows on my phone and nothing works as soon as the tv is added. What do I troulbeshoot? Trying to access hoopladigital.com via the Smart DVD. I got all the way to the LOGIN, but it only allows the numeric key for Email and password. Any suggestion how to enter alpha? Hello Bong - Smart DVD is not listed on Hoopla's Help pages as a compatible device. However, if your device has a web browser, it may work. As for changing the keys for your device, unfortunately, I can only suggest that you reference the manufacture's help material or you may also contact Hoopla directly for assistance at info@hoopladigital.com. Ita saddening that the limit has been reduced to 4 titles per month. I enjoyed being able to read more than 4 books in a month. Will the limit ever be increased? We love Hoopla and were disappointed to see the checkouts dropped from 10 to 4. I'm sure it's expensive but it's a fantastic service. Please raise the Hoopla check out limit back up please. This is the best online library service around, and I joined this library just to use it. Please and thanks!!!!! I use Hoopla heavily for reading on my daily commute, with 3 hours each day, I read through many books, I am so upset that the number of rentals have dropped from 10 to 4! Now I cannot watch movies and read, I have to choose and limit my entertainment. I am also disappointed in the reduction in number of monthly checkouts. I made it through 4 books in the first two weeks, leaving me counting down the days until February starts. Why can I only check out four items? Very disappointing. Please increase. After calling the public library several times and,talking to several librarians by phone and in person (who were all very patient and understanding) , I am still unable to connect my Roku to Hoopla. I followed instructions, created a Hoopla account with a librarian's help, accessed the website, but still no luck in being able to connect and watch videos . The Roku code shown on TV Hoopla screen did not work I also spoke to some technicians via a number provided for tech support computer screen who tried to extort more than 100$ from me, saying that I could not get Hoopla until I renewed my account for $100. I am still not able to watch any movies on Hoopla. Very frustrating. Has anyone else had this problem? Can anyone offer a solution? I have tried to sign up with hoopla, but my library card # keeps being rejected with a message that only 20 characters are supported and to enter a valid library card. I have entered my 14 digit # exactly as it is on my library card with no results. I have no trouble using overdrive. Suggestions? Hi Cynthia - based on your comment alone it is a bit tricky to tell exactly what the issue is. Would you please send us an email using the Contact Us link at the bottom of this page? That way one of our librarians can get in touch via email and work with you directly. Thank you. Add a Comment to Stream Movies, TV, Music, and Audiobooks Free with Hoopla!